With a near 100% success rate of projects completed on time and to budget you can be assured that when you engage Closewood, your air conditioning installation will be completed by skilled engineers who take pride in every aspect of their work. Planning and implementation are the key elements for a successful air conditioning installation. During this process you will be taken through every step of the project and notified immediately if there are any areas of concern. Closewood have the experience and expertise to know exactly how long it will take to instal your equipment. The process that we use to determine how long it will take to complete an installation is the same if the installation is many units, across multiple floors, or just for one room. 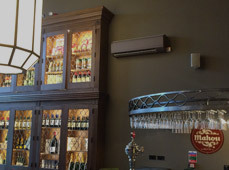 No matter how big the project air conditioning has an indoor unit connected to one outside. After the equipment has been installed, there will always be an overnight pressure test to ensure that your system doesn’t leak when the refrigerant is added. Once the pipework has been tested and inspected and seen to have held pressure, then the refrigerant will be recharged, the system setup, commissioned and handed over to you. This process is the same for single unit air conditioning projects, up to bigger installations that supply multiple rooms. All that needs to be taken into consideration is the amount of piping required to feed each unit, along with the pressure testing of each element. Based on this knowledge we know that the smallest project can take as little as two days, the larger projects dependent upon the area to be supplied. Rest assured that whatever duration of the project is agreed that will be when the project is completed no longer. There are numerous situations where air conditioning is required: in a new construction or in a refurbishment such as a shop or office redesign, or building upgrade. Replacement of conventional boilers with air source heat pumps is also becoming more popular. With every new construction we work in tandem with the site manager and ensure our work fits into the structure and timetable of the project. We work and liaise with the accompanying teams and trades on that project and can adapt to suit every need. You will find all Closewood employees skilled, knowledgeable and dedicated to doing the best job possible, with the sequence of tasks having a balanced flow and all work areas kept and left tidy. Our engineers are fully trained, experts in their field, very motivated and always looking ahead to see ways in which a project can be improved, or for any possible problems on the horizon. With a refurbishment of operational workspace there will hopefully be as little disruption as possible, and you will find that our engineers and on site staff will make sure you are kept informed about each stage of the project, and tell you about the areas that will be affected by the next task. You’ll find this flow of information allows you to keep on top of the project and able to measure how successful we have been. Do you guarantee a finishing date? Yes we do. As you have seen above we know how long it takes to install and test a system and unless something unexpected occurs, such as a delayed delivery, then if we say a project will take four days to complete, it will be finished in four days. Every installation is finished to a very high standard and the time given accounts for that standard to be met. Is there any building you can’t install into? If you want air conditioning we can install it. We’ve installed into almost every type of environment: from lifts to wine cellars, office blocks, houses, sheds, garages and military barracks. Even listed buildings pose no problem. If you have the building control and planning permissions in place, we can install air conditioning into any delicate room or space. One recent example is a listed building that needed an old morgue converted into a wine cellar. 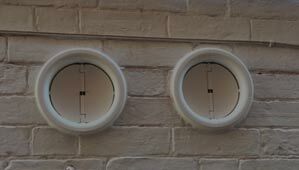 Due to the conservation issues we had to use a certain type of unit and make all the pipework hidden. It was difficult but not a problem. If you would like to know more details about this project, or have any questions about the installation process please give us a call.